The prosperity and the success of each agricultural enterprise depends on the quality of machines and equipment, so more and more owners prefer imported products. The choice of course is a complex process so it should be noted that the pros and cons, there are like the imported products as well as in the domestic, but foreign technology in great demand today. 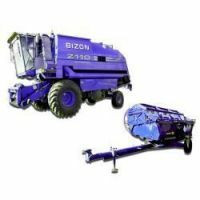 The underlying factor is the company's financial possibilities and in this sectional import / agricultural machinery is not always afford. But do not give up on her, unnecessarily. price aggregates formed due to their high cost, then mk labor workers evaluated highly. In most cases, these machines are subjected to a multi-stage quality control system used for their manufacture expensive and extremely high-quality materials, and conduct test trials. Choosing should remember the fact that the imported products is compulsorily soot. quality standards, and that is confirmed by certificates. There is a myth about the origin of many problems with imported equipment such as repairs, the purchase of spare parts, MOT. In fact, no special equipment will not cause trouble, provided the approach to the acquisition of what is called "the mind". One of the main distinguishing features is the availability of the majority of units and units that you will not need to disassemble half of the harvester to replace the void part. At the time of the purchase of imported equipment, first check the availability of guarantees. When sodtrudnichestve with the official. dealers can avoid any surprises and troubles. It can still be noted ease of use, and reliability. They also are equipped with onboard computers to monitor a slave. process and techn. comp. and it is all provided that employees do not need to be retrained to work mk imp. predstavlet technique is not much difficulty. In any case, you need to compare the characteristics of the main. Technique must be selected correctly and competently, and should be made a miscalculation, some of the units easier to repair in case of damage.